I recently came across Trader Joe’s cauliflower gnocchi and have completely become obsessed! 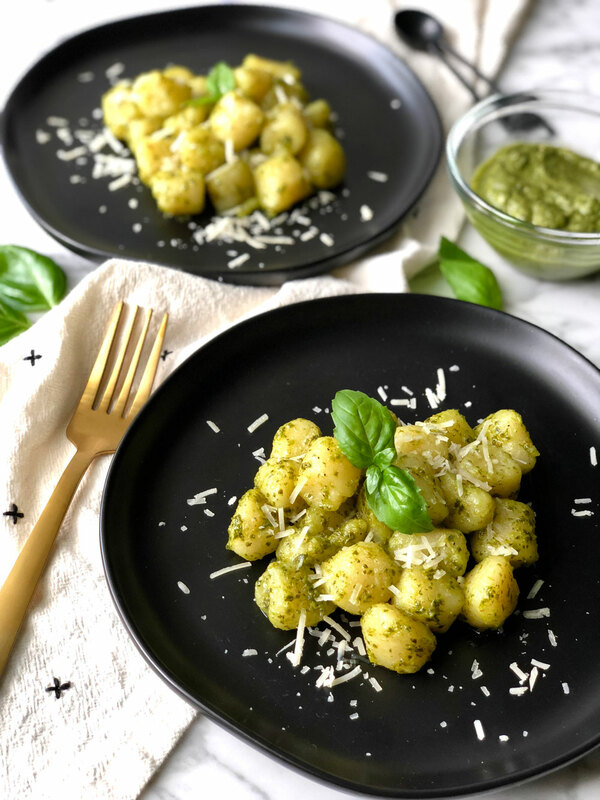 My dear friend Brooke Zigler shared her favorite gnocchi pesto recipe with me and I am excited for you guys to check it out. Brooke is a registered dietitian based in Austin, Texas. Just like me, Brooke specializes in weight-loss nutrition and her own personal story is quite incredible. You can read about it here. We both love cooking and creating healthier version of our favorite recipes so it was a no brainer to share her nutritious recipe with all of you guys. I didn’t have the pesto sauce that she uses below, so I made my own. If you have TJ’s pesto on hand, use it but if not definitely try my pesto recipe – it is delicious! STEP 1. Heat large skillet to medium heat and coat with olive oil spray. STEP 2. Add a package of cauliflower gnocchi into skillet and sauté for approximately 10 minutes or until gnocchi is thoroughly cooked, constantly moving pan to ensure gnocchi does not stick to the pan. STEP 3. Add pesto sauce to gnocchi and mix well. STEP 4. Plate gnocchi and garnish with parmesan cheese and fresh basil (optional). Save remaining sauce for other uses. Where can I buy Trader Joe’s cauliflower gnocchi please as I live in the U.K.? It is not available in the UK yet.